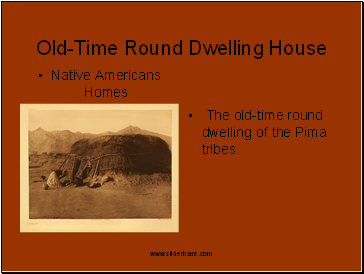 The old-time round dwelling of the Pima tribes. 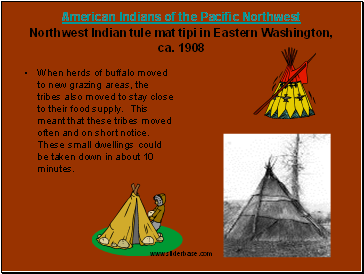 When herds of buffalo moved to new grazing areas, the tribes also moved to stay close to their food supply. 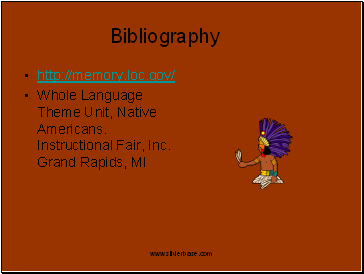 This meant that these tribes moved often and on short notice. These small dwellings could be taken down in about 10 minutes. 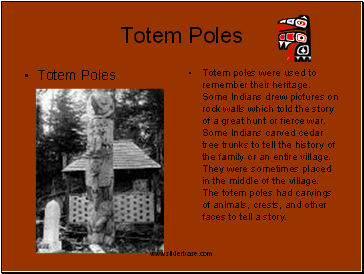 Totem poles were used to remember their heritage. Some Indians drew pictures on rock walls which told the story of a great hunt or fierce war. Some Indians carved cedar tree trunks to tell the history of the family or an entire village. They were sometimes placed in the middle of the village. The totem poles had carvings of animals, crests, and other faces to tell a story. A totem pole may have any number of figures on it. 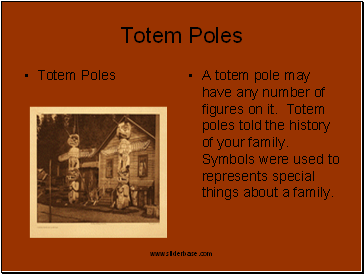 Totem poles told the history of your family. Symbols were used to represents special things about a family. The Hopi rug contains several triangles. 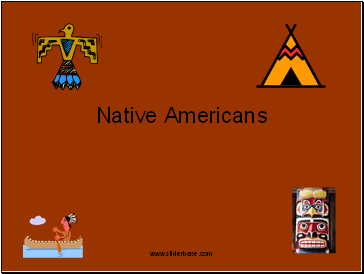 The Indians had access to cotton and wool. 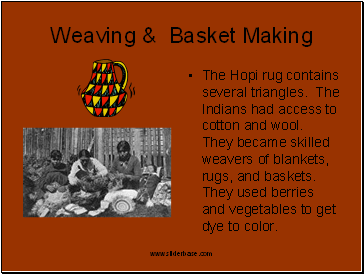 They became skilled weavers of blankets, rugs, and baskets. They used berries and vegetables to get dye to color. Young dancers from an unidentified tribe demonstrate fancy dancing at the rodeo. 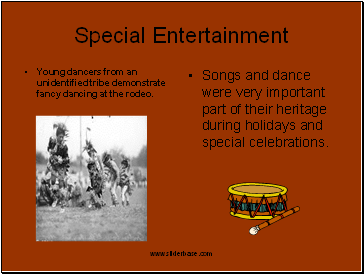 Songs and dance were very important part of their heritage during holidays and special celebrations. Two Native Americans standing in front of tipis, with tents and other Native Americans in background. Location not given, likely taken in North Dakota. 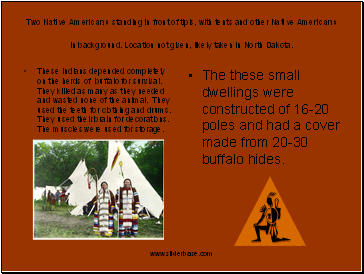 These Indians depended completely on the herds of buffalo for survival. They killed as many as they needed and wasted none of the animal. They used the teeth for clothing and drums. They used their brain for decorations. The muscles were used for storage.